Working with groups, I sometimes experience a kind of stillness where I think people become more present to that subtler and deeper sense of connection and belonging. It’s the sort of silence that transcends the efforts of efficiency experts. 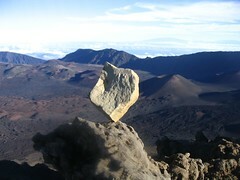 The above is a photo of a rock I balanced on the rim of the crater of Halekala on Maui last week. I think this captures something of what Johnnie is talk about.